I LOVE Baileys. Love love love. Smooth chocolaty deliciousness, with the perfect hit of booze. So, why not bake with it?! I thought the Superbowl would be the perfect occasion for these boozy treats. I love brownies; they’re my cake-of-choice. Cake? Yes, cake. I’d rather eat brownies as the “base” of a cake than something with a cakey texture, any day. I think what I’m basically saying is I prefer the dense indulgence of brownies over the fluffiness of cake. HA! It’s true. THESE were ultra-super-mega-fudgy. 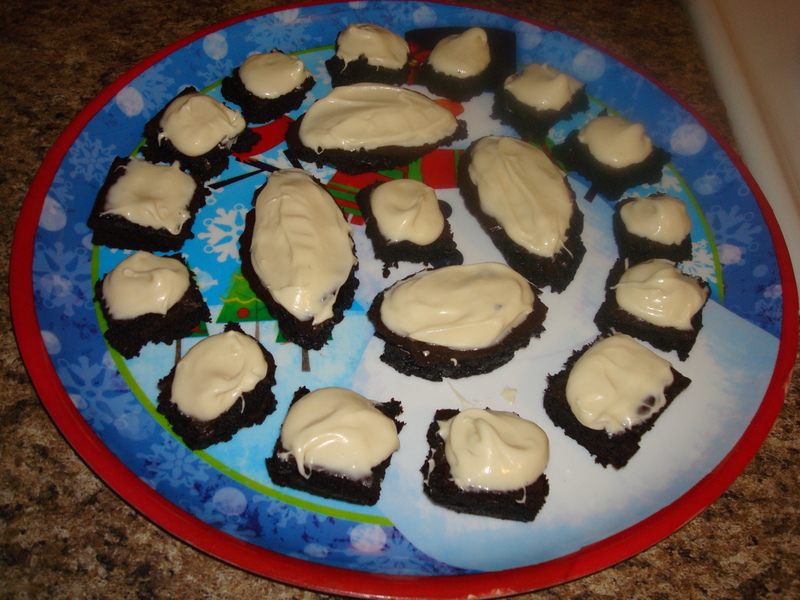 Ideally, I wanted to cut the brownies into the shape of footballs (as seen by 4 of the brownies in the photo above). Unfortunately (or, err, fortunately) they were just too fudgy for the cookie-cutter! So I settled for the usual squares. Oh well. What could make these brownies better? Why a Baileys Cream Cheese Frosting of course!! Oh-my-yum! Don’t worry about the shape. You could just have a pile of brownies. Doesn’t matter, they will taste PHENOMENAL! I was actually pretty surprised at how strong the Baileys taste pulled through even after the baking process. You truly can taste it! 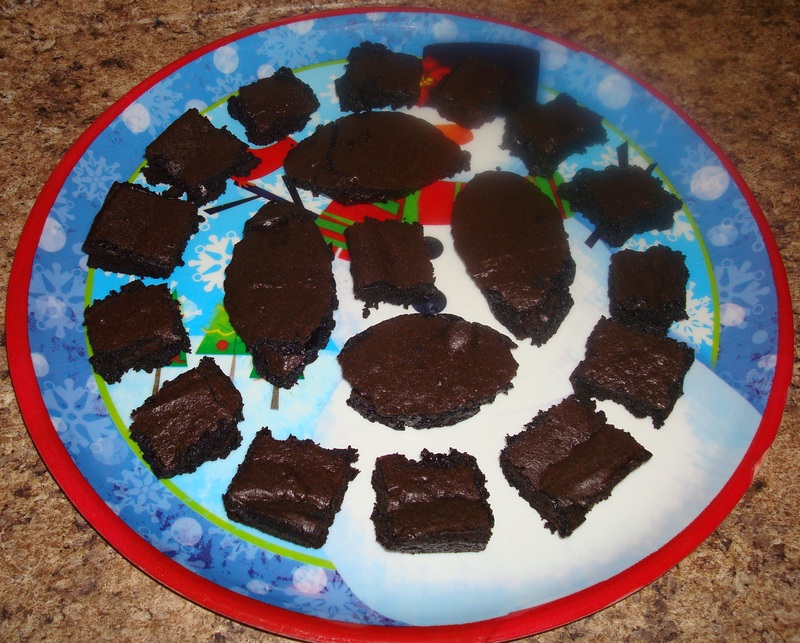 There were no brownie leftovers at the Superbowl party I went to; they were a hit!  Without further ado– here is the recipe! Give it a try and let me know what you think!! 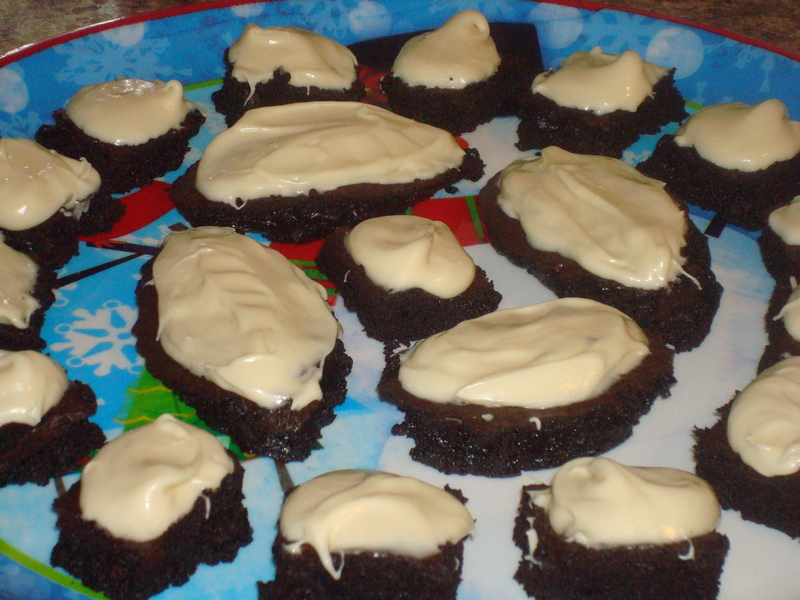 Boozy Baileys Brownies with Baileys Cream Cheese Frosting! 1) Preheat oven to 350 degrees F. Line a 15 x 10 in jellyroll pan with foil and spray with nonstick cooking spray. 2) In a large microwaveable bowl, add the butter and chocolate chips. Melt in the microwave a 30 second intervals until fully melted. Make sure to stir after every 30 seconds to make sure you do not overheat the mixture. It will probably take about 2 minutes. Set aside to cool a little. 3) In a medium-sized bowl, sift together the flour, baking soda, baking powder, salt, and cocoa powder. Set aside. 4) Add the sugar to the butter and chocolate. Whisk until smooth. Add in the eggs and vanilla and whisk again until smooth. Switch to a spatula and fold in the flour mixture until only a few streaks remain. Add in the Baileys and stir just until combined. 6) Cool completely on a wire cooling rack (or, ya know, try some warm of course)! Do make sure they’re fully cool before frosting! Using a mixer, cream together the cream cheese and butter until smooth. Add in the powdered sugar and Baileys and beat until smooth. Spread on the brownies and cut into bars! !